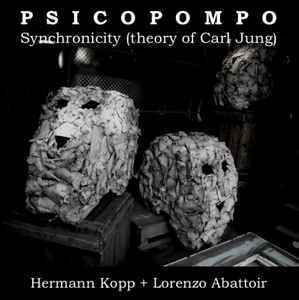 If you love the darker and more abstract works of the German composer Hermann Kopp, this latest project is for you. The violinist, known for the legendary soundtracks for the films of Jörg Buttgereit (Nekromantik, Der Todesking) has always been attracted to the morbid and occult atmospheres. In line with Psicofonico (2007) on the EVP and recordings of voices of the dead, his last album to date on Galakthorrö label (tenebrous Zyanidanger) and the cassette Sinekdoxa published last December on Alien Passengers, this new album departs from a process of sound research and experimentation. He has worked here with Lorenzo Abattoir, a young Italian musician coming from the drone / noise scene, for a musical approach inspired by the concept of "synchronicity" of Carl Jung. This idea came to the psychiatrist when he became interested in the relationship between alchemy and christianity. The idea of simultaneous events and signifiers that can not be explained rationally. Psicopompo, the name chosen for this collaboration, is an Italian term that refers to the guide accompanying the dead in the afterlife. Of course, the concept is more complex than that and everything is explained clearly in the disc, so we shall not venture out further here. One thing is certain: the musicians have never met and have used a unique writing method, incorporating the notion of coincidence. All pieces are based on a combination of separately registered rhythms and melodies and mixed as a single sound event. The album begins with two individual tracks. The first title of Lorenzo Abattoir mixes white noise, interference and shruti box in a spirit fairly near to his work. The piece of Hermann Kopp, too, shares the idea of drones, noise and strangeness, always with these so characteristic string squeaks. But where the album gets exciting is when the two worlds mingle for the remaining half an hour. Out of it emerges a freezing, unknown music as if it came from an intangible elsewhere. Recording methods and percussion may recall the "industrial" scene if that term still means something, but the result is much less easily discernible. We are here more in occult magic, some portions even unveil a recited dimension, almost liturgical and ritual ("PP2"), which will only increase as the journey goes on. The whole is deeply frightening, disturbing, inviting to the beauty of another world ("PP4"). Weird, you said, weird? Psicopompo is the death guide that accompanies the dying to the afterworld. Synchronicity is the occurrence of two or more events that appear to be meaningfully related but not causally related. From the conceptualization of these two themes combined, German composer/musician Hermann Kopp (of Jorg Buttgereit’s Nekromantik and Der Todesking soundtracks) and Italian Noise Experimentalist Lorenzo Abattoir (Nascitari) merge their unique compositional techniques and source equipment (Hermann Kopp: Violin, Tambourine, Electronics / Lorenzo Abattoir: Shruti Box, Timbal & electronics), leaving the results entirely to chance. The final result is the unity of an audio event joining together 2 separate executions of melody and rhythm without any post production or added effects, bringing out the forlorn emotions of being on the journey to the new world upon death.